Precious metal prices were broadly unchanged this week, confined to a tight trading range of $1210 to $1185 for gold and $16.60 to $16.00 for silver. There were several attempts by sellers to force prices to break down, but from the price action there appeared to be buyers waiting for the opportunity. The result was that yesterday gold rallied to as high as $1209 and silver to $16.50, though they closed well under these best levels when a senior Federal Open Market Committee member warned that interest rates would not remain at zero for ever. Comex volumes in gold were light though they were better in silver. Gold's performance in other currencies has been more impressive, especially in euros and sterling shown in the next chart. 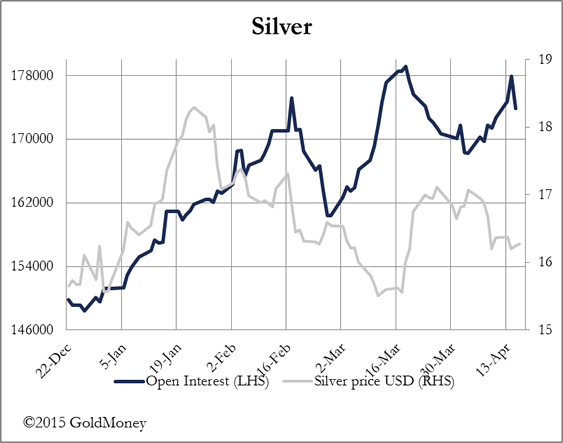 Open interest on Comex in both metals rose over the week, with silver's close to a record high on Wednesday. This is consistent with accumulation on dips and should be viewed as generally positive. Silver's Open Interest is shown in the next chart. 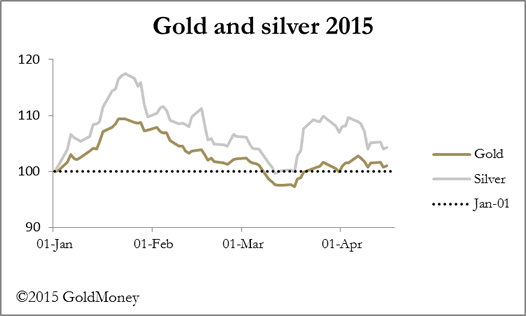 Physical demand for gold continues to be strong, with the news that India imported 125 tonnes in March, while Shanghai Gold Exchange deliveries totalled a further 195 tonnes. Global mine production on a monthly basis is about 250 tonnes, so the markets must have delivered a net 70 tonnes more than this production to satisfy just two Asian sources of demand. One wonders how much demand from other Asian buyers is also being covered by deliveries from Western vaults. This tight delivery position is at odds with technical trading in paper markets, with gold confined to its current range. Presumably (and this makes sense) western mines are hedging the price by selling for forward delivery, putting a short-term cap on the market. One of the more intriguing news developments is a joint World Gold Council/Official Monetary and Financial Institutions Forum (OMFIF) meeting this morning in New York to discuss the inclusion of gold in the SDR basket when it is revised later this year. It was agreed in 2010 that the renminbi should be included, but this has never been ratified by the Americans. It is believed by close observers that China's exclusion from the SDR is one of the reasons China set up the Asia Infrastructure Bank rather than pursue the IMF relationship. However, if the proposal to include a weighting for gold in the SDR gets any traction at this morning's meeting, it will be interesting to see the reaction from the Americans, given that the Chinese appear to want to incorporate gold into international settlements. 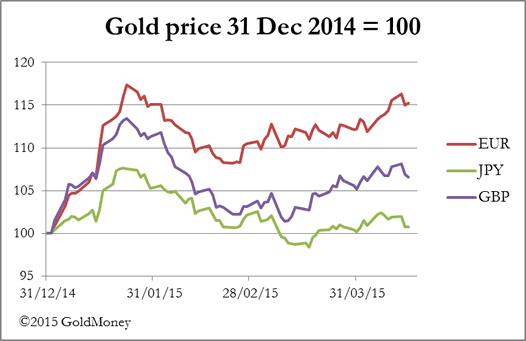 It could also provide the Chinese cover for declaring an increase in the gold content of their official reserves. For what it's worth, the chairman of OMFIF (Lord Desai) is quoted as saying gold's inclusion in the SDR is quite likely to happen. However, there are legal obstacles to overcome. Tuesday. Japan: Leading Indicator (Final), Customs Cleared Trade. Eurozone: ZEW Economic Sentiment. Wednesday. UK: BoE MPC Minutes. Eurozone: Flash Consumer Sentiment. US: Existing Home Sales, FHFA House Price Index. Thursday. Eurozone: Flash Composite PMI, Flash Manufacturing PMI, Flash Services PMI. UK: Public Borrowing, Retail Sales. US: Initial Claims, Flash Manufacturing PMI, New Home Sales. Friday. Japan: All Industry Activity Index. US: Durable Goods Index. After the collapse of the Bretton Woods system in 1973, the SDR was redefined as a basket of currencies. Today, the SDR basket consists of the euro, Japanese yen, pound sterling, and U.S. dollar. The value of the SDR in terms of the U.S. dollar is determined daily and posted on the IMF's website. GoldMoney customers hold almost 21 tons of gold in storage worldwide, and own a combined total of US$1.6 billion in precious metals. GoldMoney has its headquarters in Jersey and also has offices in London and Hong Kong. It offers its customers storage facilities in Canada, Hong Kong, Singapore, Switzerland and the UK provided by the leading non-bank vault operators Brink's, Via Mat, Malca-Amit, G4S and Rhenus Logistics.